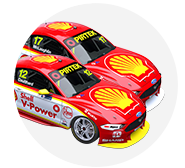 Scott McLaughlin scored his sixth win of the 2017 Virgin Australia Supercars Championship on a tough day for his nearest title rival Jamie Whincup at the Coates Hire Ipswich SuperSprint. Pole-sitter McLaughlin didn’t have it all his own way in the early stages, losing out to fellow front-row starter Craig Lowndes at Turn 1. It then took less than three laps for McLaughlin to overtake the Caltex Holden, which pitted on the following lap for two tyres and a splash of fuel. The early stop allowed Lowndes to emerge ahead once McLaughlin pitted seven laps later but the youngster again proved too good, easing by on lap 13 and sailing onwards to victory. CLICK HERE for the full Race 15 result. Extending his championship lead over Whincup from six to 111 points, McLaughlin said he enjoyed the early fight with Lowndes. “I thought this one is not bad for me but he just got me,” said McLaughin of the startline battle with his Holden rival. High tyre degradation meant pitstop timing was crucial, with those pitting early forced to hang on in the closing stages. Lowndes fell to fifth by the flag, leaving third-placed starter Chaz Mostert to sweep into second. Shane van Gisbergen went in the opposite direction to Lowndes, splitting the race in two and charging home on his fresher tyres. Re-joining from his stop eighth of those to have pitted, van Gisbergen eventually took third from Tim Slade on the final lap. Starting 13th Fabian Coulthard followed the same strategy as his fellow Kiwi and managed to salvage valuable points with sixth. Whincup, who was demoted to 14th on the grid thanks to a five-place penalty for pitlane contact with James Moffat in qualifying, meanwhile took the flag in 20th. The Red Bull HRT driver’s hopes of a top 10 were dashed by an air spike issue that significantly delayed his pitstop. Regardless, the six-time champion struggled for pace and spent the bulk of the race behind leading wildcard driver Jack Le Brocq. 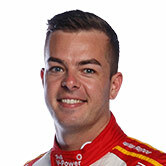 Todd Hazelwood completed his Supercars championship debut two places further back in 22nd, while fellow wildcards James Golding and Shae Davies were 24th and 25th. Nick Percat ended a strong day for Brad Jones Racing in seventh ahead of Rick Kelly, Mark Winterbottom and David Reynolds. Michael Caruso faded from eighth on the grid to 15th, while Cameron Waters likelywise struggled from ninth to 16th. The opening lap proved disastrous for James Moffat, who took damage when he was spun courtesy of contact with Dale Wood at Turn 3 which required time in the garage. Alex Rullo’s Holden was also damaged as he swerved to avoid the mess, ending the teenager’s race. Jason Bright later joined the youngster on the retirements list when an engine problem struck his Prodrive Ford in the closing stages.